A Multinational Information Technology and Education Company’s foray into Medical Tourism and to create the Largest Medical Tourism Operations in India and 6 countries Globally. The Brief given to Re-Engineering Business Solutions (RenB) was to build a Comprehensive Strategy for 5 years with an Execution Plan to Create, Launch , Operationalise the Largest Medical Tourism Company in India with Operations in 6 Countries within the First year and expand it to 14 Countries in 2 years. Also enable the service offerings in 7 Metro Service Cities in India. RenB Worked out a ‘Logo to Launch to Success’ under the Ambit of the RenB StartUp Program for the Project Delivery. The RenB ERM framework was critical for the Project, to ensure the Stakeholders had a clear view of the Risk Elements going forward. The Strategy for Short, Medium, and Long Term with Goals was created and confirmed with Various Stakeholders Internally and Externally for Feedback and Confirmation. The Execution plan was Created with Timelines and Milestones. RenB Associates put in a Business and Functional Structure Cost Mechanism using RenB Business and Revenue Model Framework. The Company was incorporated with the Design of the Logo getting Created based on a Workshop for Design with Stakeholders approval. RenB Associates then prepared the Organisational Structure Required to Acquire the Customer and Service the Customer as per Execution Plan. RenB Used its ORG building Framework which has its Unique Approach of FITCOM i.e. 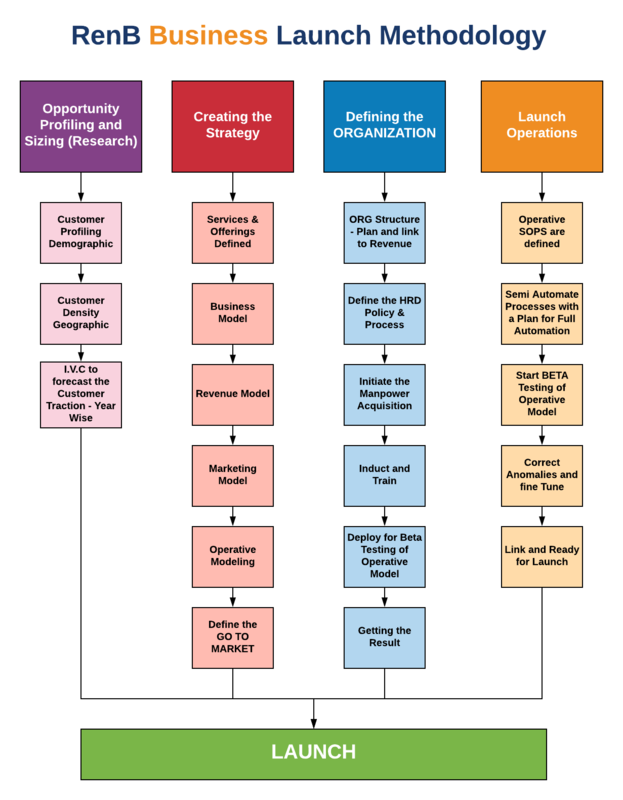 Fit the Company ORG to the Strategy and Execution Plan. The Associates used the Research Data and Workshops to Simulate various Scenarios to arrive at the right ORG Structure based on Least Cost and Maximum Customer Satisfaction Gain as a benchmark. The Customer 5 point Customer Satisfaction Program was created to ensure that the Customer Services became the DNA of the Organisation. The Manpower and Deployment Plan with RenB HRD framework being the First Process to be Completed post the Project Kick-off . The Compliance Procedures was Implemented in 3 Countries. The infrastructure for the Operations as Per plan was set up in Chennai , Kolkata and Dhaka , Bangladesh. The Recruitment Process and Operational SOPs for all Operation areas was created and as the People started getting Boarded, the SOP’s was getting Implemented and Tested at Various Levels. The Marketing Team was prepped to Prepare the Launch plan as per Execution plan in Bangladesh and India as phase 1 Launch. The Process Automation Through an IT Intervention using RenB Process Automation Framework was simultaneously being Deployed by RenB Associates and the Client Team to Capture and Automate all the Processes and ensure Real-time Visibility for Accurate Decision Support System ( DSS). The RenB Team started working with the Operational Team of Dhaka and Training (Skills ,Process and Operational Metrics), Deployment and Launch Prep. The Dhaka Team was Ready well before Launch. The RenB started working with the Clients Chennai and Kolkata Teams for Training (Skills ,Process and Operational Metrics), Deployment and Launch Prep. The Chennai and Kolkata Team was Ready well before Launch. Business Support Functions like HRD, Finance, Legal , Corporate Communication was setup and the Teams having Disclaimer : The contents of this case study is the exclusive written property of Re-Engineering Business Solutions an India Registered company and which holds exclusive rights to this Case study and its Contents. Copying & Distributing of the contents of this case study is legally not allowed without Permission of ReEngineering Business Solutions and its representatives. All Rights are Reserved. Any Violation of the @copyright will be legally liable with Legal Jurisdiction in Mumbai, India. Undergone the Training (Skills ,Process and Operational Metrics) and Functional Readiness for Business support started and Completed the Functional Support Operational Tests. The Functional Metrics as per RenB Functional Frameworks was used to ensure the Standard of best practices was maintained. The RenB Corporate Governance Mechanism was deployed at Client HQ to handle the Multi City, Multi Country Operations to ensure Operational Control and effective implementation of the Growth Metrics. Post Launch the System checks were conducted for all Transactions and Process Audit was implemented with the RenB Continuous Improvement Program Framework put in place and enabled the Management team to see the Real-time Variance if any and take corrective measures. The Client having seen the Impressive Results post Launch signed on RenB to continue the Support and Help with the RenB ScaleUP Program.